Go bigger and bolder when your wear the Allure Statement Necklace that features a larger baguette crystal atop a 30mm base. The Statement Dot you snap in will be shown off to perfection! This necklace is the perfect choice if you want a bit of “bold and beautiful”! The east-west Czech baguette at the top is just the right amount of “bling” . This was the first Style Dots necklace I purchased and I wear it almost every day. Even after nine months, it still looks shiny and new. It goes with any Dot I choose, from the more classic Dichroics to the fabulous Coutures! Definitely my go-to piece. I love this necklace!! It’s my favorite. Looks great with Couture Dots and Shimmer Dots!! Love the Allure Line with the Baguettes which bring out the contract of the Statement Dots. This paired with the Couture line Statement Dots look fabulous. My favorite line in all the styledots - just be careful not to get it wet - sometimes the black comes off. I love the distinctive but delicate accenting and especially enjoy pairing with my favorite Couture Dots. This necklace length is perfect for my size and allows the gorgeous Dot to proudly sit above my blouse. This is my favorite necklace for a statement Dot! 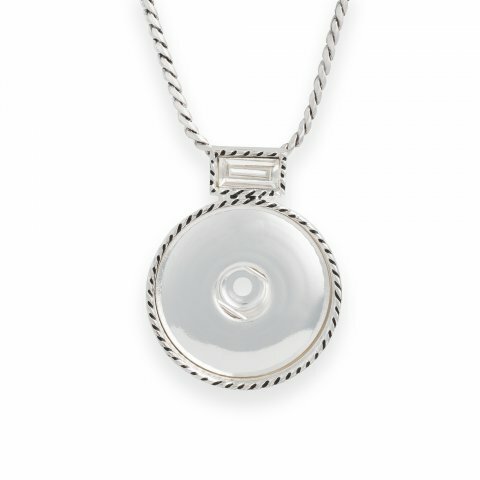 It's simple enough to let the Dot receive all of the attention, not the necklace! I absolutely love this necklace! It has amazing details! When I wear this necklace people get whip lash trying to turn their heads to get a second look at this necklace! Love that I can wear it with jeans or leggings or dress it up with a couture Dot! One of my favorite necklaces! Looks great all "blinged" up with the Couture Statement Dots, but looks just as great "dressed down", with a more simple Statement Dot! Love the allure line! Simple yet elegant! Great for literally ANY occasion! I love my necklace its very classic look it goes with a lot of different looks. I am very satisfied with this item.